Clean, healthy water should taste fresh, be free of odor and color, and should feel good on your skin when you bathe. Does that describe your water? If not, then you may have impurities or imbalances causing water problems. Watercure USA is the water problem solving specialist of Buffalo and Western NY. If you are experiencing dry, itchy skin, and signs of psoriasis then click this section to see if it might be your water that is causing your symptoms. Drinking water is supposed to be refreshing and have an undeniable clean taste. If you’re noticing your water has a weird taste then take a look here for answers. If your water is doesn’t look clean, then there is probably something wrong. Click here to learn about what is likely making your water turn different colors. Having smelly water can be embarrassing. If your water has a bad odor, take a look here to see what’s making your water smell so bad -- and how we can help you get rid of the smell. No matter the culprit or contaminant, Watercure can offer a solution to your water problem. We start with a FREE water test. 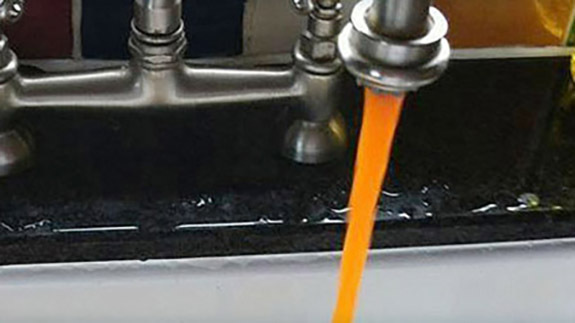 Once we know what’s in your water, we design and implement a custom solution to help you achieve clean, clear, healthy water for your family or business. To discuss your water problems or schedule a FREE water test with a Watercure technician call 716-946-3598.